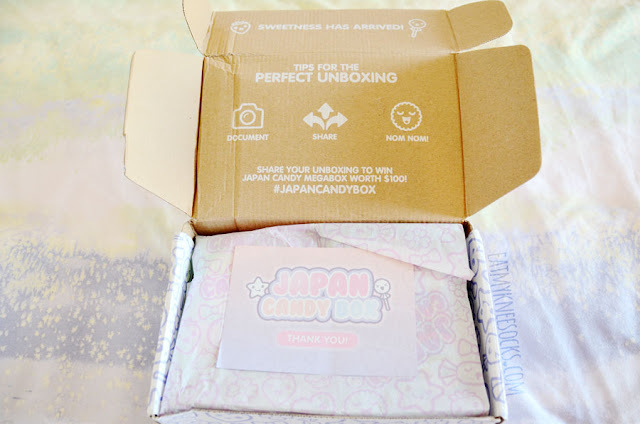 This is my second time collaborating with Japan Candy Box to bring to you guys an exclusive review and giveaway of their lovely snack subscription boxes! 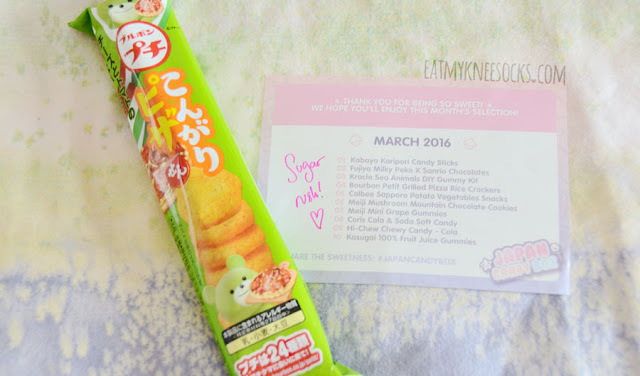 I had an amazing experience last year with their June 2015 box (reviewed here), so needless to say I was more than happy to review their March 2016 box! 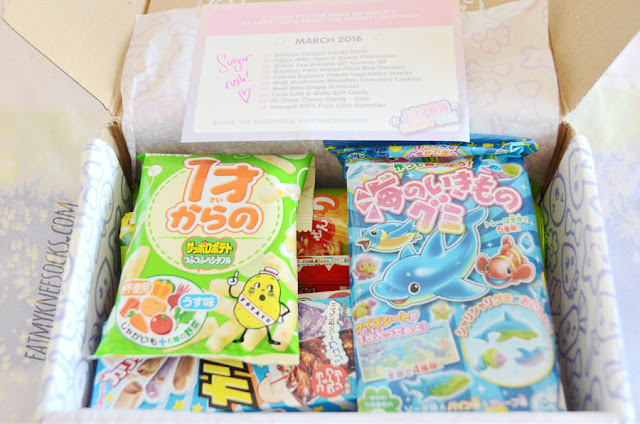 If it's your first time hearing about Japan Candy Box, it's basically a monthly subscription service that sends you a box filled with adorable and delicious Asian snacks. 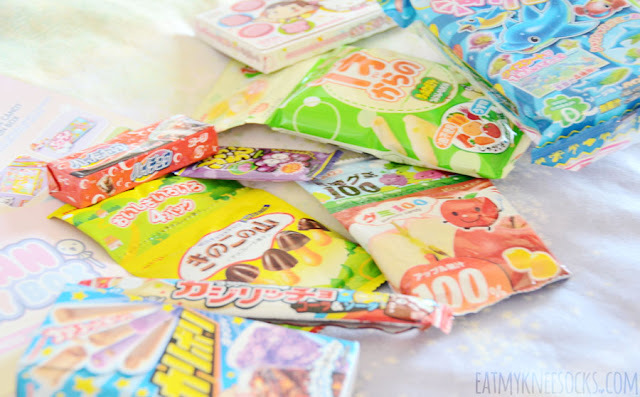 They have free shipping worldwide, with prices starting at $18.20/month, and their boxes include products from popular Japanese brands such as Pocky, Hi-Chew, Meiji, Hello Panda, Yan Yan, Puccho, Kabaya, Popin' Cookin', and tons more! Each box contains 8-10 carefully-picked sweets and treats, with a variety of candies, gummies, chocolates, and even savory snacks. 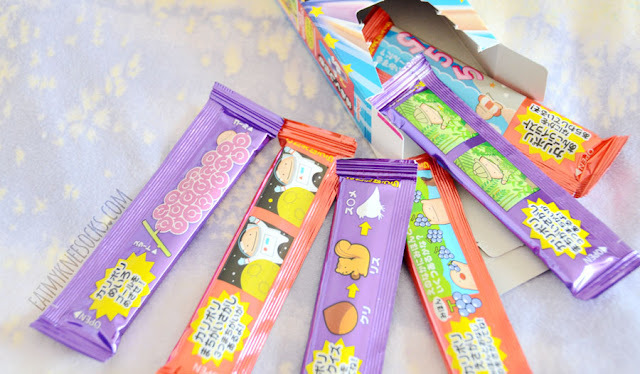 The adorable Japanese packaging, eccentric flavors, and overall cuteness of these monthly snack boxes make them perfect for anyone who loves Asian snacks! 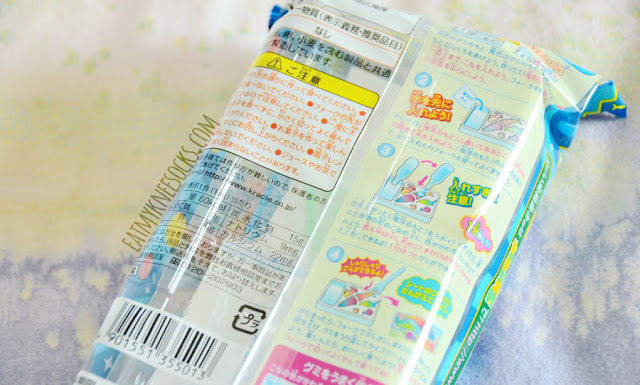 Compared to last time, Japan Candy Box has stepped up their packaging with an even cuter box than before! The March 2016 subscription arrived in an adorably-designed box, with 10 items packed carefully and adorned with tissue paper. 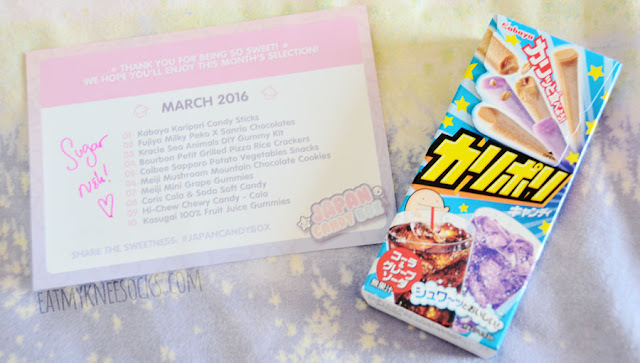 The first item in the March 2016 Japan Candy Box subscription was a box of Kabaya Karipori candy sticks. 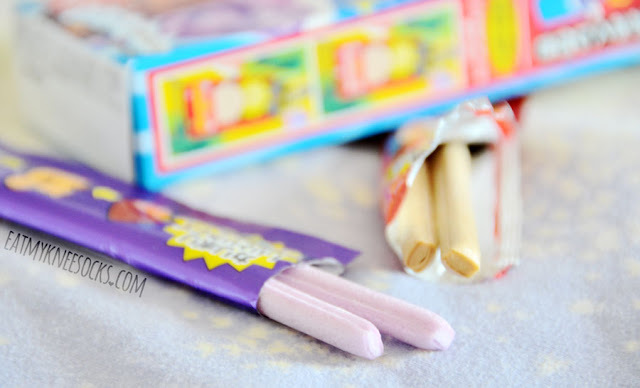 Inside the box were six individual packages containing two candy sticks each. These candies come in two flavors: cola and grape soda. This was the first of quite a few soda-flavored items in the March 2016 box, and the soda-inspired taste is definitely noticeable. 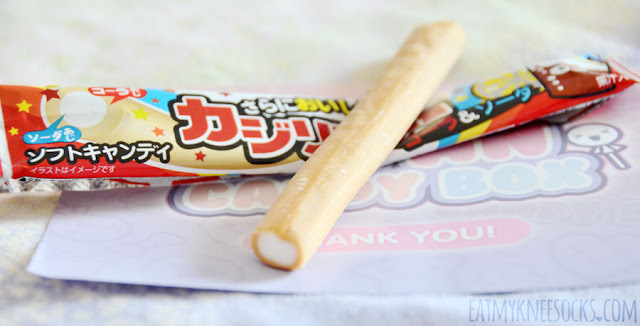 Although these snacks are shaped like biscuit sticks, they taste almost like hard candy with the fizziness of soda. I personally found these to be a bit too sweet for my liking, though the flavor is definitely unique. 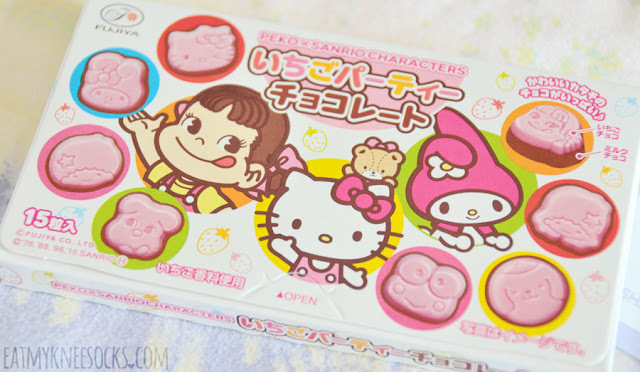 Next up are the perfect sweet sensations for anyone who's a fan of Sanrio and their adorable characters that have become internationally-recognized icons, like Hello Kitty, Keroppi, and more! 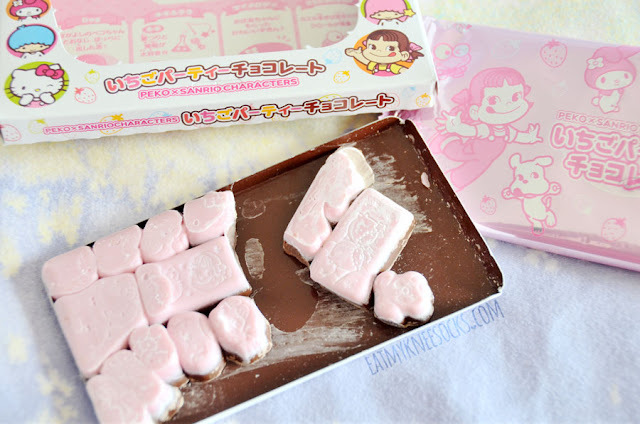 This box of Fujiya Peko x Sanrio chocolates combines a layer of pink strawberry chocolate with a layer of milk chocolate for a unique take on smooth, creamy chocolate. Sadly, these chocolates were melted and misshapen from the heat, so a lot of the pieces ended up stuck together, and the character designs were barely recognizable. 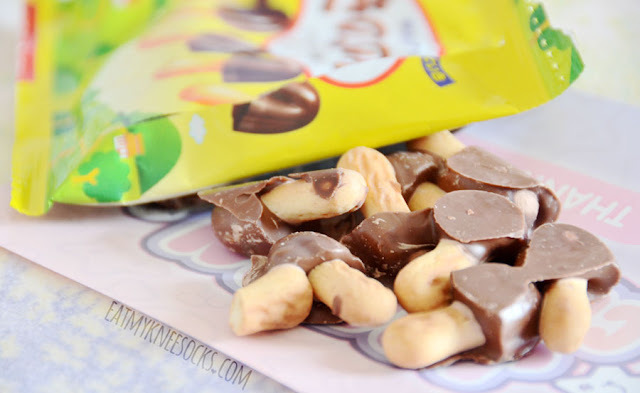 Although that was definitely a disappointment, the chocolates taste great otherwise, with just the right amount of sweetness and a touch of strawberry chocolate flavoring to make them stand out. 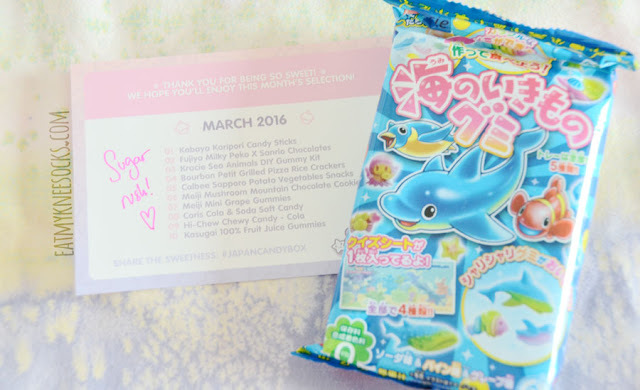 I've noticed that each Japan Candy Box tends to come with a DIY candy kit, and the March 2016 box is no exception. 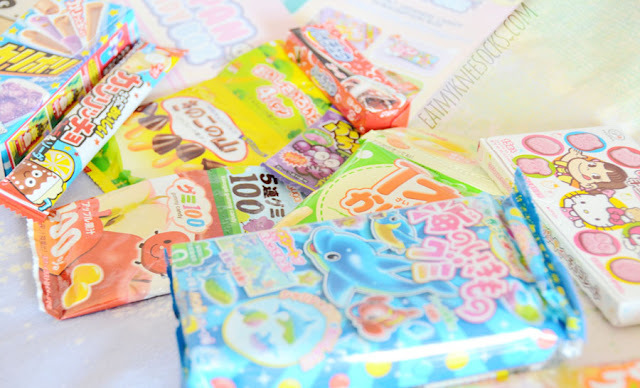 In this box were DIY sea animal gummies, which you can customize with your own color combinations. I haven't had the time to try it yet, but it looks adorable and I can't wait! One of my favorites from the March 2016 Japan Candy Box was the Bourbon Petit pizza-flavored rice crackers. Although I definitely have a sweet tooth and tend to crave sweets, candies, and chocolates much more often than chips or other savory snacks, these rice crackers are absolutely delicious. 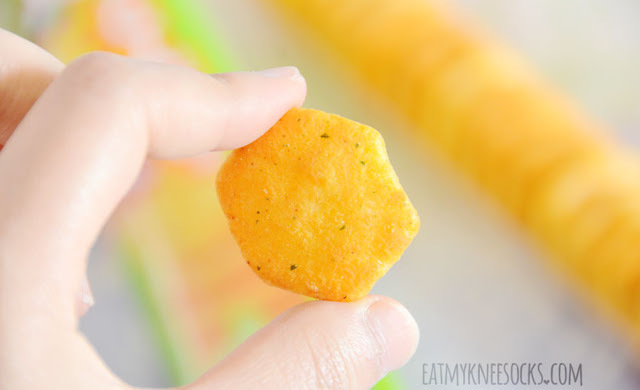 They don't actually taste a whole lot like pizza, but have a wonderfully flavorful combination of salty and sweet flavors, with the puffed, crunchy texture of cheese puffs. 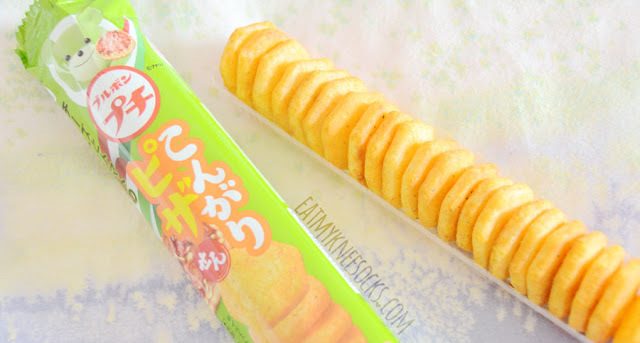 These are definitely a snack that I'd order on my own, and I'm grateful for getting the chance to try them and discover this amazing snack through Japan Candy Box! 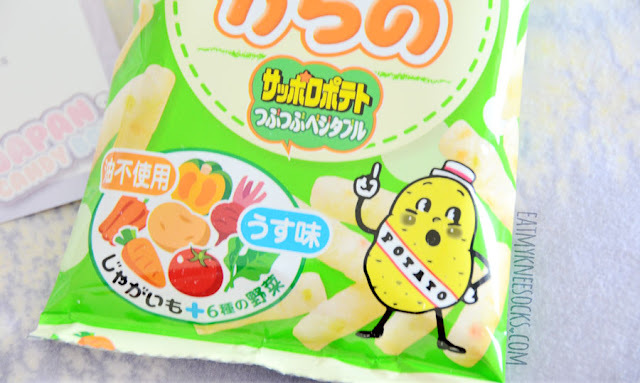 Another savory snack in this box were the Calbee potato snacks, made from real Sapporo potatoes. 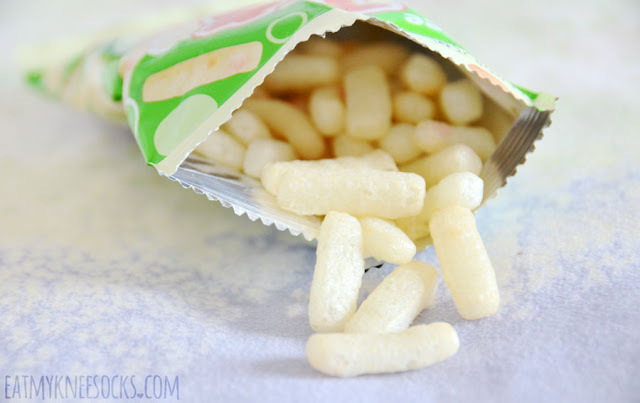 These potato snacks have an amazingly light, puffy texture, but I think they lack a bit of flavor. 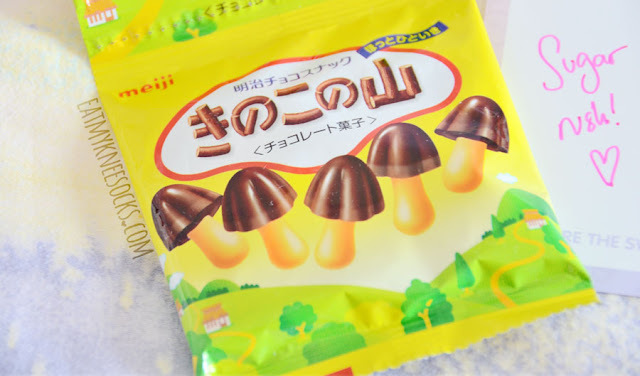 Next up are the Meiji mushroom chocolate cookies, a snack I've seen in nearby Asian supermarkets, but never decided to try. Unfortunately, these suffered the same fate as the Peko x Sanrio chocolates, and were melted and stuck together due to the heat. Putting that tragic aspect aside, however, these chocolate cookies taste great! I love the combination of sweet, creamy milk chocolate and crunchy biscuits, and taste-wise these are definitely another one of my favorites from the March 2016 box. 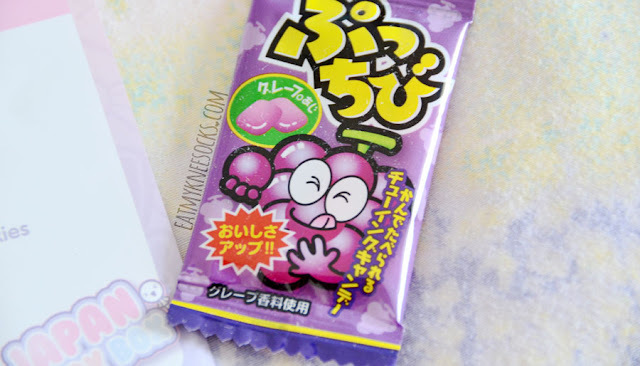 Another Meiji item in this box were the Meiji mini grape gummies, a small pack of chewy purple candies. Although they're tiny in size, they pack a good amount of flavor, combining fruity sweetness with a touch of sourness. 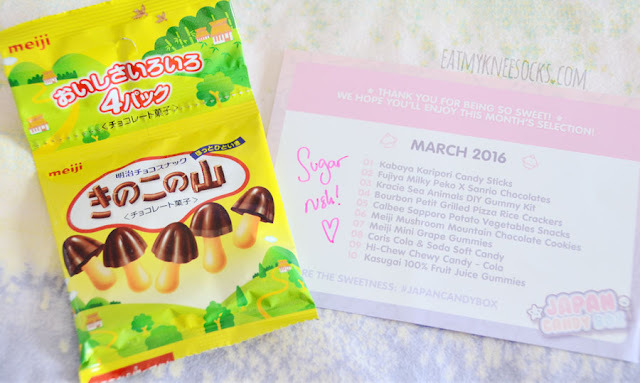 Another soda-flavored candy in the March 2016 Japan Candy Box was the Coris soft candy, a dual-layered chewy candy with soda and cola flavors. 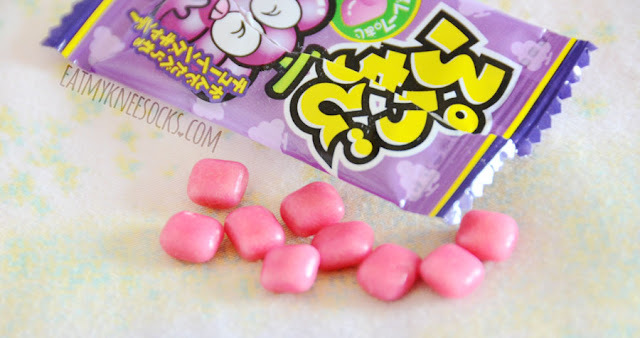 These candy is very quirky and unusual, with a soft texture and strong soda flavor. I'm not a big fan of the texture personally, but it was interesting to try. 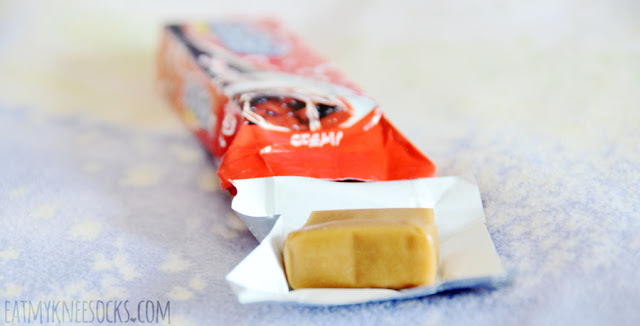 The last cola-flavored treat in this box was the Hi-Chew cola candy. Although I'm not the biggest fan of soda-flavored candy, despite how popular it is in Japan, I actually really liked these chewy Hi-Chew candies. 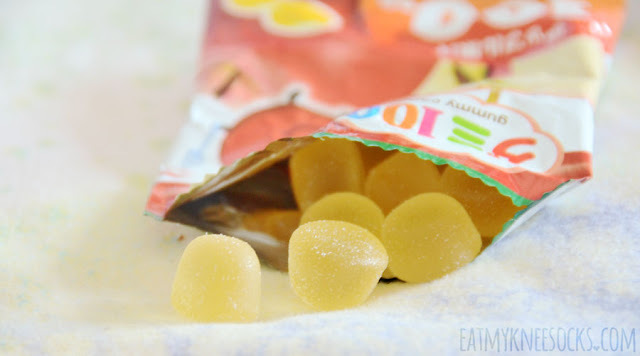 The soda flavor isn't too strong, and there's a lot of sweetness and juiciness in the chewy candies to balance it out! 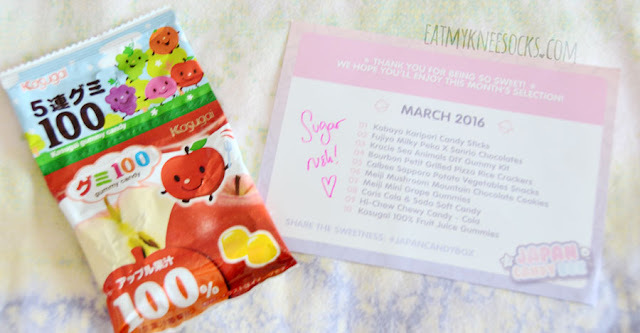 The final treat in the March 2016 subscription box was a bag of Kasugai fruit juice gummy candies, which I got in the apple flavor. 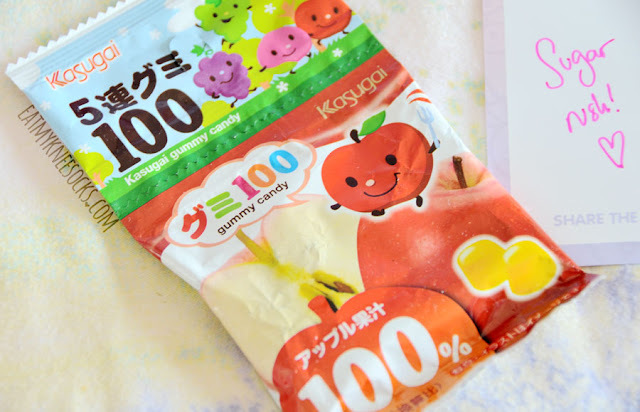 Since they're made of 100% fruit juice with no artificial colors or flavors, the fruity taste is very strong, and these gummy candies taste just like apple juice, only with an extra touch of sweetness and a delightfully chewy texture. 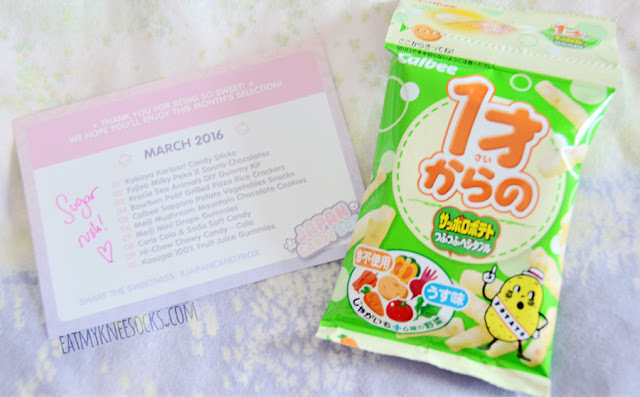 I had lots of fun trying out all the snacks in the March 2016 Japan Candy Box, and everything from the design of the overall box to the packaging and taste of the individual snacks was so incredibly cute and adorable! I'm rather disappointed that the two chocolate snacks ended up damaged due to heat since they were two of my favorites in terms of taste, but in general I enjoyed this month's box. 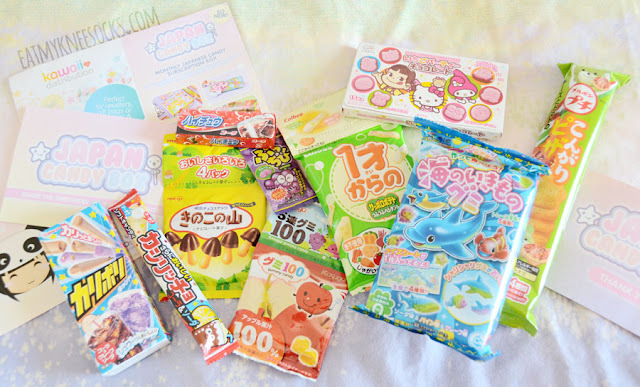 The amazing thing with a subscription service like Japan Candy Box is that it allows you to discover a ton of new snacks and try new things that you might not ever have tried otherwise. 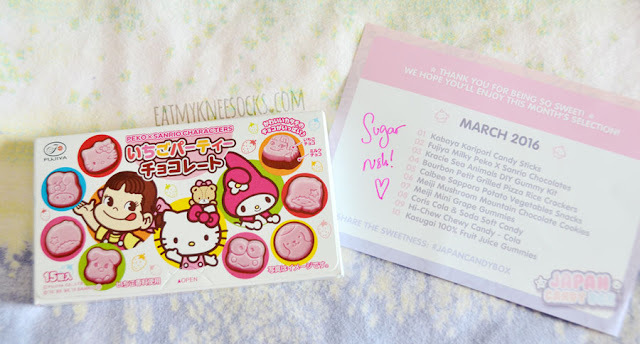 I've definitely discovered some new favorites from this month's box, and the overall cuteness makes it so irresistible! 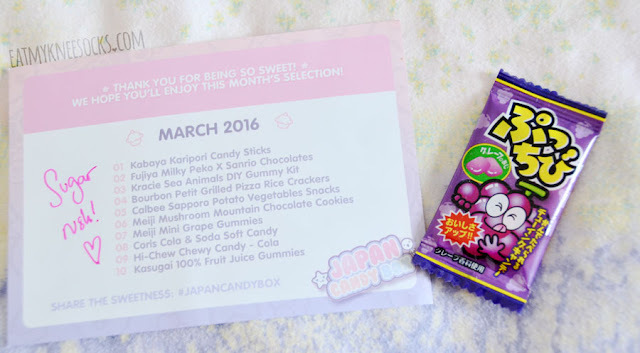 To win your own box of delectable and adorable treats from Japan Candy Box, enter my giveaway below! 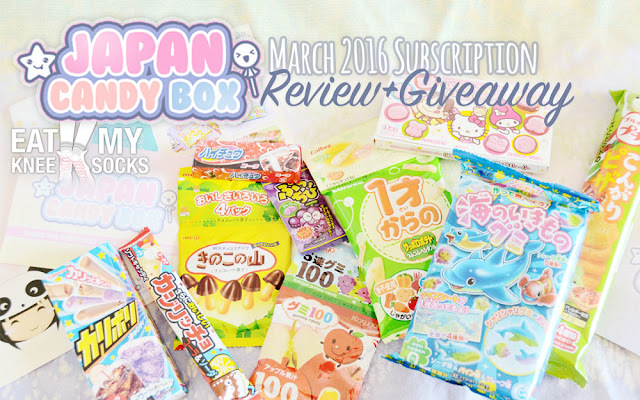 One lucky winner will receive their own Japan Candy Box to enjoy. Be sure to enter quickly because the giveaway ends soon!